1. When did you start practising to become a percussionist? I started at the age of 7. I Started learning violin from my thatha Violin V. Thyagarajan. When I went to one of his concerts in Kanchi Mutt, as the concert was happening I was playing beats on his violin box. Kanchi Maha Periva took notice of it and asked my thatha to teach me mridangam instead. So my chinna thatha (grand father) Kanjira V.Nagarajan, started teaching me. 2. Did you have an idol? 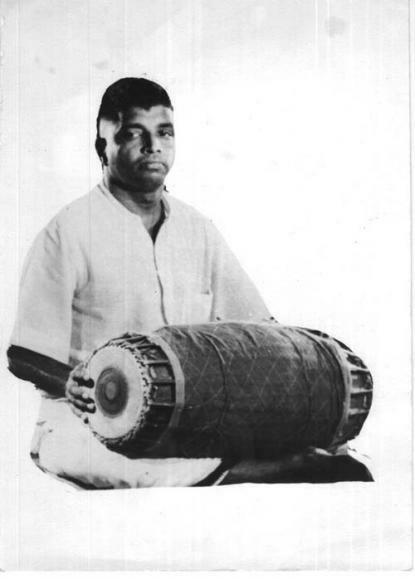 After having learnt a bit of mridangam, my dad introduced me to the great Palghat Mani Iyer. Introduce in the sense that he played me tapes of mani iyer accompanying. 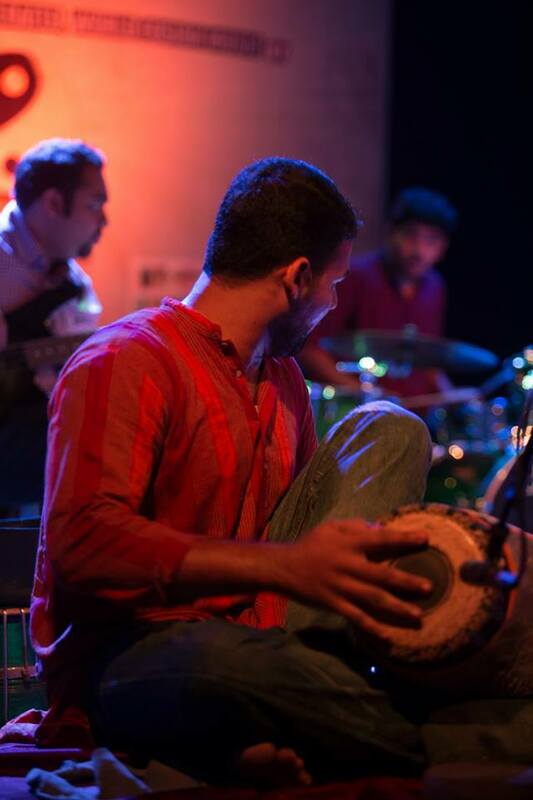 Till date if I have a dream, it is to play one concert like Palghat Mani Iyer and quit playing for life. 3. Did someone inspire/influence you to become a musician? If yes, who and why? I was born into a family of musicians. Everyday there would be practice sessions happening taking place in my house. I actually found it hard to study. So at the age when I started, I had no thoughts, as in to takeup music or not. Its more like a daily routine like how you brush your teeth. after learning for like 10 years, I was in total love with the art. So decided that I would not give up music for any reason. 4. When did you realise your seriousness towards music? When I miserably performed in a concert. Because I was the only musician in my class (at school), I played in school functions et cetera which got me lot of accolades and praise. However, I became very complacent and gained over confidence. And when I played my first concert in a Sabha, I performed miserably. My grand father who attended the concert felt disappointed and I could see the same on his face. He was silent on returning home. I later cried for disappointing him and realised how terrible my Mridangam talent was and since then I started practicing really hard. 5. Do you think you can become a full-time musician? Yes or no and why? Yes I could have become a full-time musician and in fact wanted to be one too. But, I was not sure if just being a musician could make me enough money and support my family. Hence the thought of dual profession arose. Today, I am a Sales and Marketing professional working for Vroom, a Tech Startup in Chennai. 6. Do you practise music daily? If so, how long and why? Yes, I practice almost daily. It does not matter how long you practice. But what matters to me is the quality of practice. After having practiced for so long, I realize this. Even if its 15 minutes of playing Mridangam, its the intent with which you practice that is important. This is my opinion. 7. Describe your musical journey over the years? I don't believe in this term. Because at the time you are going through something (experience) you don't really know the cause and effect of it. So at a later point in time saying this was good or this was bad doesn't really make sense because, at the point when you pause and look back its a different you. Had you known what you know today at that point in time in your own history, things would have been different. right? I feel for what ever has happened i was a mere execution machine for what was destined to happen. I also was a witness to what ever had happened. I hold no opinions of my past nor I carry any judgments into my future based on my past. Fusion Band. Why have you restricted yourself from performing for other bands or musicians? Why have you restricted yourself from promoting your work? I haven't restricted myself from playing for other bands. I did play for electric circus band a few months back. Its just that i don't approach people to give me opportunities. With Oxygen, its a different issue. I am there in the band from the time it was formed. I'm comfortable with the band. More than any professional relationships, we have been great friends with each other for almost 14 years now. There is absolute trust and dependability on each of the band members. So I'm happy to be with MY band. 9. Do you have plans of composing music in the future? Nothing to plan as such. I have already composed 5 songs for Oxygen Fusion Band. Also, in the band we go by the approach of composing songs on collective inputs. From that angle, every oxygen composition has my bit of creation also into it. So I am already a composer in that sense. 10. If not music, would you have chosen another occupation? Yes, I was planning to join the army after my 12th. Due to unforeseen circumstances then, I could not else would have definitely joined the Indian Army. 11. What are the challenges you have faced as a musician? If I now say something was a challenge, then there are two possibilities. Either I have found a solution or time has passed by. I also believe that as time passes by they would not be challenges any longer because it is a different you that is seeing a challenge. Its a different perspective with which you see something. So from that sense, nothing has been a challenge. 12. What are the challenges you have faced as a student of music? I have been a slow learner throughout my life. Im lazy in my own sense. I still havent played even one concert in the likes of the great Palghat Mani Iyer. 13. I know you teach a student or two. But, do you have intentions to start teaching in a grander scale? If yes, when? Ya I currently have 3 students. I really haven't thought about doing it a grander scale as I love to take things as they come. As of now I haven't "planned" anything. 14. What is it like to be a musician and at the same time have a parallel profession? It really helps from a financial perspective to have a dual profession. Even from an emotional angle it helps in the sense that, when you are frustrated with one, you can switch to the other. I think I would have gotten into some addiction but for my parallel profession. 15. You perform with Oxygen Fusion Music Band and some times Carnatic artists, but will we see you doing solo shows in the future? No, I would never do solo shows. I see myself as an accompanist and in my opinion I specialize in it. Even in Carnatic concerts, I do not enjoy playing Thani Aavarthanam. But the current concert format actually requires you to play a rhythm solo. But I have high regards for artists who really specialize in playing solo. Its just that I don't like it.